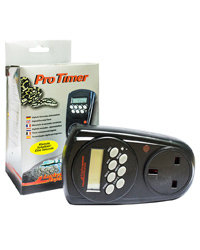 The Pro Timer is a more versatile digital device that allows programmed switching periods as short as one second! This is ideal for use with Foggers, Misters and Rain Systems, where short but accurate activation periods are required. Another advantage of this timer is that it can be programmed over a full 7-day week period with different settings for weekdays/weekends or even each day if required. Up to eight freely programmable time slots are available. There is even a 'randomised' delay period that will cause the normal switching programmes to start between 2 and 32 minutes later than the set time so that some degree of variation can be pre-set. An internal battery retains the settings in the event of power failure and a useful quick-switch feature allows the time to be advanced to and from 'Daylight Saving Hours' in spring and autumn without affecting the operating times. The maximum load of the Timer is 3250W. It is not recommended that the timer model is used to switch Metal Halide and Halogen lamps. Under some circumstances and with some lamp models, the higher demands of these lamps may damage the timer. Really good product, needed a timer that worked down to the second and this was value for money after searching online auction sites and only finding products from China which in my opinion is a bit of a gamble. 100% satisfaction and great customer service kept me updated via e-mail on dispatch and arrival time. Couldn't find any to be honest. The item arrived promptly and after some puzzling over setting the timer, the penny finally dropped and the timer is working well with my fogging system. Considering getting another for the mister. Good range of time settings from 1second to 24 hours per day.